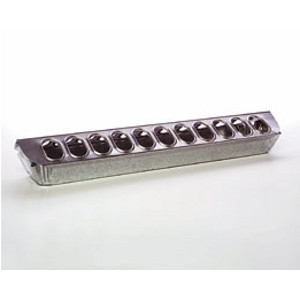 Classic feeder for adult chickens and other birds, with 14 feeding holes (7 on each side). Covered top helps keep debris out of the feed, while individual holes minimize waste. Top slides off for easy filling and cleaning. Made of heavy-gauge galvanized steel for years of service, with rolled edges for safety. Measures 12.5 inch long by 3.875 inch wide by 2.75 inch high.